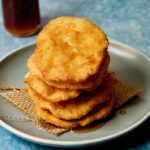 Prestiños are traditional Costa Rican confectioneries, consisting of a thin, fried dough and tapa de dulce (panela) syrup. In a large bowl, mix the flour and the salt. Dig a well in the center and break the egg. Mix and add water gradually. Add enough water to form a smooth and homogeneous dough. Divide the dough into 12 pieces and form balls with them. Place the balls of dough on a tray lined with parchment paper, cover them, and put the tray in the fridge for 4 hours. Remove the dough from the refrigerator and, using your hands, stretch it finely to form the prestiños. They must be round and about 6 inches in diameter. You can moisten your hands with ice water to help stretch the dough. Deep fry the prestiños over medium heat on both sides. The dough should form small blisters and get a slightly golden color. In a saucepan, add the water, tapa de dulce and salt. Cook over medium heat until the tapa de dulce has completely melted and has formed a syrup. Serve the prestiños with the syrup drizzled on top.